When John F. Kennedy ran for president in 1960, he took pains to assure voters he would not let the Pope influence American politics. Forty-four years later, another Catholic JFK is seeking the White House, but this time, his opponents are trying everything they can to get the church leadership involved. From President Bush seeking the Vatican’s help on social issues to the decision by some Catholic bishops to deny communion to pro-choice (but not pro-war or pro-death penalty) politicians and their supporters, some on the right are actively trying to portray John Kerry and others on the left as “bad Catholics.” But such attempts could well backfire, as it appears the majority of Catholic voters dislike the selective and political co-opting of their faith. 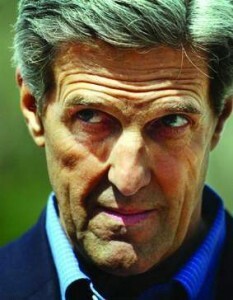 The most recent attack against Kerry comes from Marc Balestrieri, a canon lawyer and assistant judge of an ecclesiastical court in Los Angeles. He is filing “heresy” charges against Kerry with the Archdiocese of Boston, on the grounds of Kerry’s pro-choice position. Balestrieri says his goal is Kerry’s “repentance, not excommunication,” but the latter could happen if the Archdiocese chose to press charges. That’s highly unlikely, considering Kerry’s hometown Archdiocese has already gone on record that it will not publicly deny communion to anyone for political reasons. But this is just another in a string of attempts to try attacking former altar boy Kerry’s Catholic credentials. However, as a poll of Catholic voters in the same Time article points out, these heavy-handed attempts to divide Catholics may very well backfire. The poll found 70 percent of Catholics think the church should not try to influence the way they vote or tell Catholic candidates what stances to take. Seventy-three percent said Kerry should not be denied communion, and 83 percent said the bishops’ stance will not change how they vote. The poll also found an unforeseen advantage of the communion controversy for Kerry – more than a third of voters now know he’s Catholic, a higher percentage than know Bush’s denomination. “Interestingly, the same bishops have not singled out other Catholic politicians who hold to the same positions. The focus on Kerry looks to be part of a campaign aimed specifically at defeating Kerry, not a church-wide purge of Catholic officeholders who support lawful abortion. The Pope and the national hierarchy also have condemned the death penalty and the war in Iraq. Are these bishops willing to deny the Eucharist to Catholic politicians who support the death penalty or the Iraq war? And if not, why not? Moreover, will they tell Catholics that it is a sin to support an unjust war and to vote for a candidate who is responsible for such a war? And, again, if not, why not?…It is curious, to say the least, that 30 years after Roe vs. Wade, the issue of denying the sacraments would be raised during this election year.